I ran across your blog through the wordpress homepage and enjoyed looking around. I used to live in Chicago and grew up in the surrounding counties so it’s funny getting a glimpse back at someone else’s place there. These days we live wherever the Army sends us, and are in the middle of rehabbing our first house. Fun to see your ideas! Oh, and I guess wordpress is going all snobby on me and not linking in my name anymore – I write about our home projects at yellowpencilstub.wordpress.com. Thanks for the welcome. :) Right now we are renting a house in Colorado, but we are from North Carolina. I’m hoping to go back soon, but we are kinda waiting for Uncle Sam to make up his mind on that one. But for now, here we sit, and your blog has already given me two ideas for home improvements when I get home. The kitty brush potty portal and I like the catio portal, but because of the way our windows are in NC (hurricane windows) I don’t think I can pull that one off. Nice to meet you and your blog, I can’t wait to see what you do next. The bathroom re-do is great. I would love to do that but we have two lights that sit on either side of mirror and now where to move them too. Then the new mirror wouldn’t be that much bigger. Oh well the idea was a good one. Love the cat brush door, hope you don’t mind me linking too it. Nice too meet you. Linda from SC. New reader, new fan, but you probably already gathered that from the other comments I’ve made. I was on FP last weekend and did the same thing you did where I followed up with a “O hai, strangers who have never read my blog before!” post. Congrats again! I think I’m done commenting but I won’t make any promises. 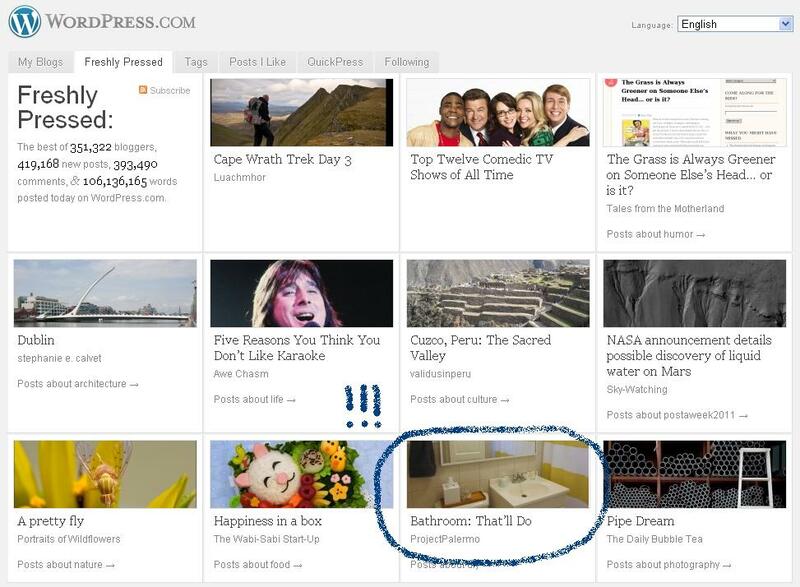 Found your blog on WordPress homepage, and I’m excited to follow it! We just bought our first house, after being stuck in a dinky apartment for 4 years, and after only living here for a few weeks, we’re already knee-deep in home projects and messes. Love seeing the pics of how things are going! A friend assured me that my blog is unhatable, but I’m sure someone will come up with something. Thanks for your comments!